Atlantic salmon spend the first two years of life in the fresh water habitats of their native stream (occasionally three, depending upon food availability). 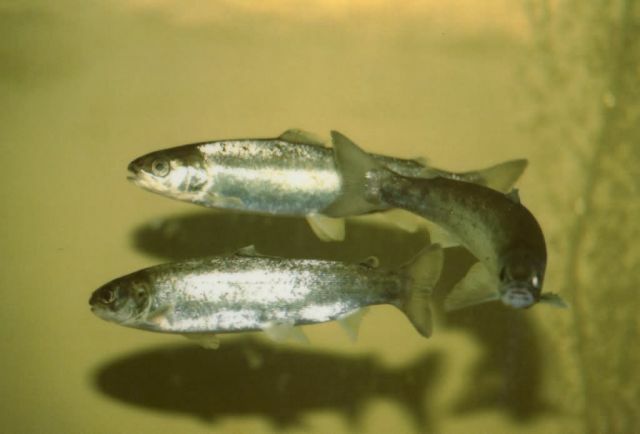 At two years of age, the fish undergo the process of smoltification, resulting in changes in certain cells of the gills and kidneys (allowing survival in either fresh or salt water), and brings about a silvery body color (better camouflage in the open ocean). Also during smoltification, salmon imprint upon the chemical "fingerprint" of their home river which allows them to recognize it upon their return from the sea.